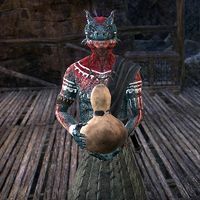 Meewulm is an Argonian of the Bright-Throat Tribe who can be found near the voss-satl player. He is very drunk after deciding to try Syl's mead, he finds that he enjoys the feeling it produces. "Ruheeva! I don't mean to seem dry to you. I can't—I can't erect my spines because of these Nord bee-ears. I wouldn't have thought to try bee-ears when they have so much honey." "Me? I have never been better! It's bonding season! I mean—I, uh, I'm not … I'm not planning on it myself, but my head swims like a mudskipper so who knows where my night may lead!" "Bee-ears! I do not know how the Nords make brew from such things, but I like it! I should have Vetra-Jat ask her guest about getting more. Perhaps she will accept weevil eyes in trade?" If he is spoken to again he will instead lead with "I did not know how much like us the Nords are. This brew they make tastes like bark and gives me deep, warm sap feelings." This page was last modified on 30 October 2018, at 04:13.